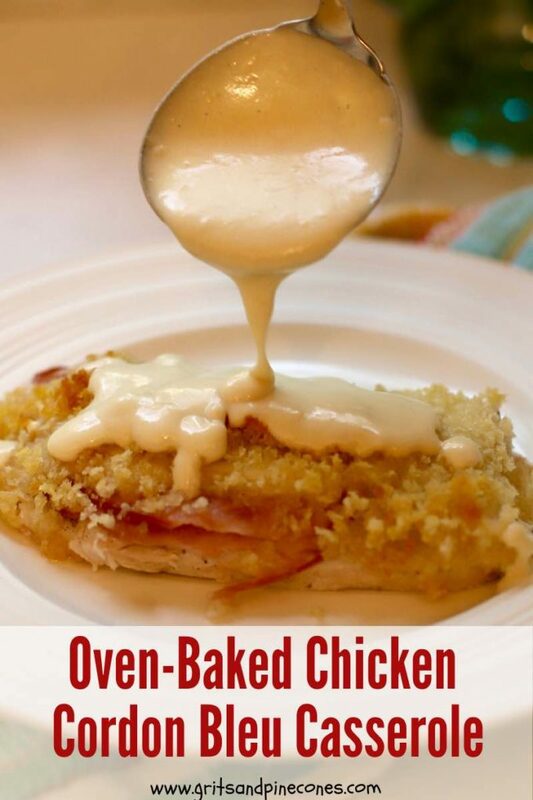 Oven-baked Easy Chicken Cordon Bleu Casserole has all of the flavor and crispiness of classic Chicken Cordon Bleu but none of the mess. It’s quick and easy to prepare and, best of all, it can be made ahead. 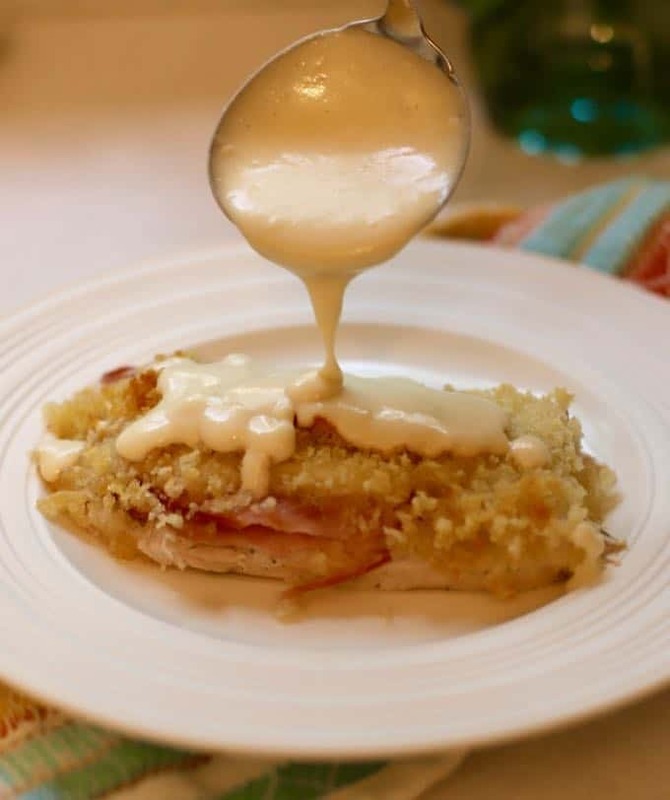 This Chicken Cordon Bleu recipe is my new favorite casserole, and while easy enough for a fabulous weeknight dinner, it is also fancy enough to serve guests at a dinner party. In fact, I have served it twice now to friends and both times received rave reviews! 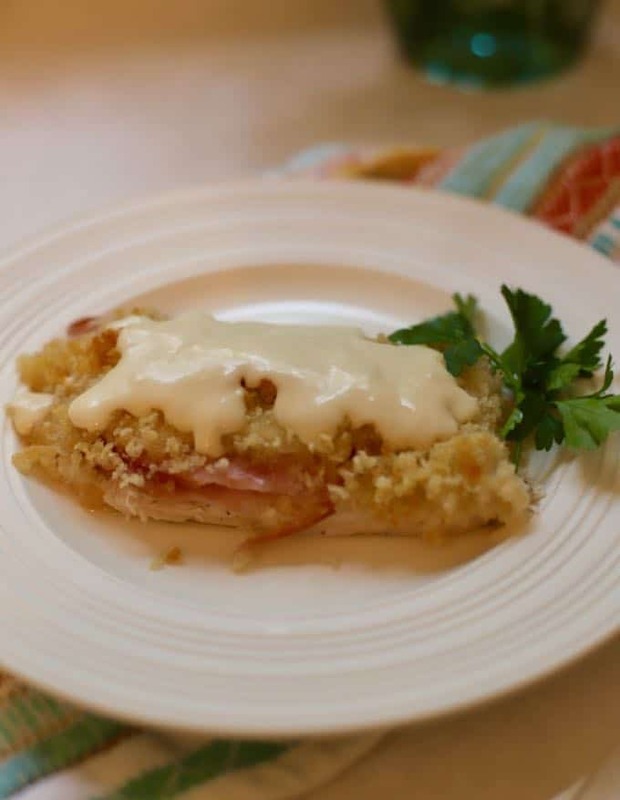 If you are like me and have ever struggled to make classic Chicken Cordon Bleu, this easy Chicken Cordon Bleu Casserole is for you. No cheese and ham falling out of the chicken bundles, and no frying with grease splattering everywhere. This flavorful casserole comes together in minutes and bakes in the oven. A delicious chicken cordon blue sauce, full of nutty parmesan cheese, tops each chicken bundle and is the icing on the cake, making this a popular family favorite. 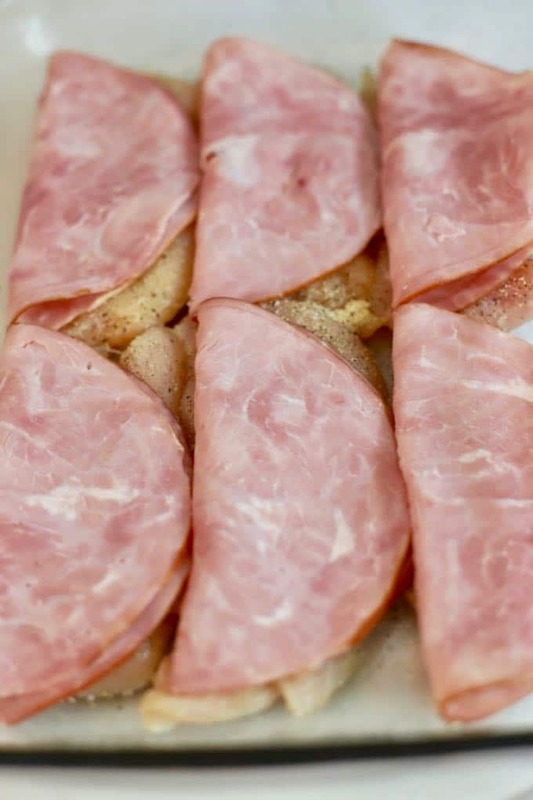 What to serve with Chicken Cordon Blue? I most recently served Easy Chicken Cordon Bleu Casserole with a simple Caprese salad and Southern Sweet and Sour Green Beans. It would also be wonderful with a simple green salad and Sauteed Spinach with Lemon and Garlic, Easy Baked Fresh Tomato Casserole, or Easy Southern Broccoli Salad. Spray a 9×13 inch baking dish with non-stick cooking spray or grease with butter. Set aside. Slowly add the milk and constantly whisk to avoid lumps. Add the chicken bouillon and continue whisking until it thickens, which should take about 4 minutes. When the sauce is bubbly and thickened remove it from the heat and stir in the mustard, Worcestershire sauce, and cheese. Stir until the sauce is smooth and creamy. 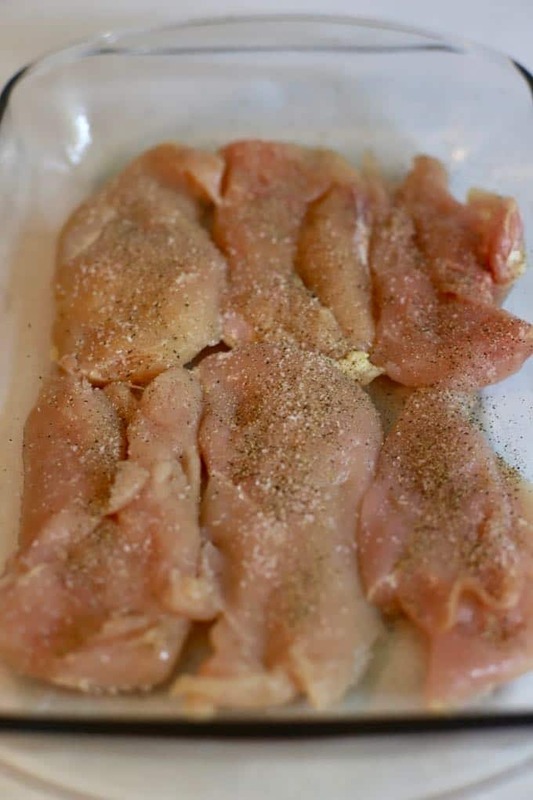 If your chicken is thicker or thinner than 1/2 inch, it will take more or less time for the chicken to cook. I would start checking at 25 minutes to make sure you don’t overcook it. 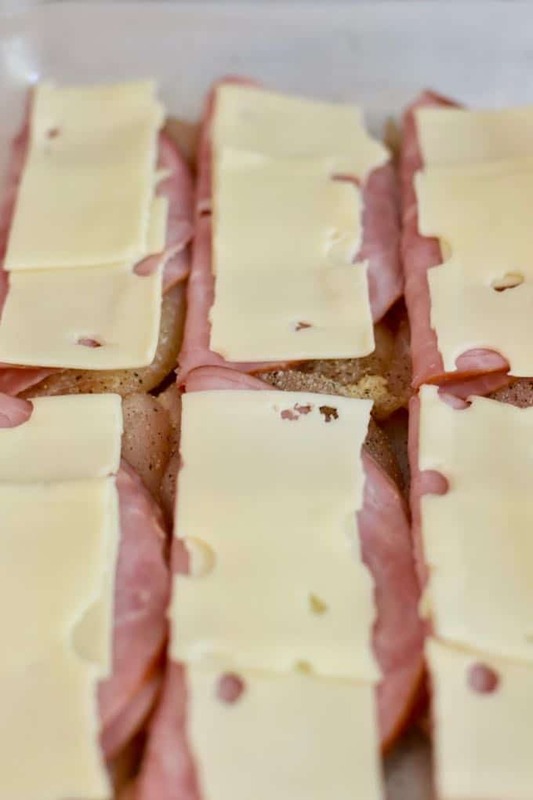 To make Easy Chicken Cordon Blue Casserole ahead, prepare the chicken and top it with the ham and swiss cheese. Cover with plastic wrap. Mix the panko and butter and store separately. Make the sauce, cool and store separately. Store everything in the refrigerator for up to 24 hours. Take the chicken and sauce out of the refrigerator and allow to come to room temperature for about an hour before baking. 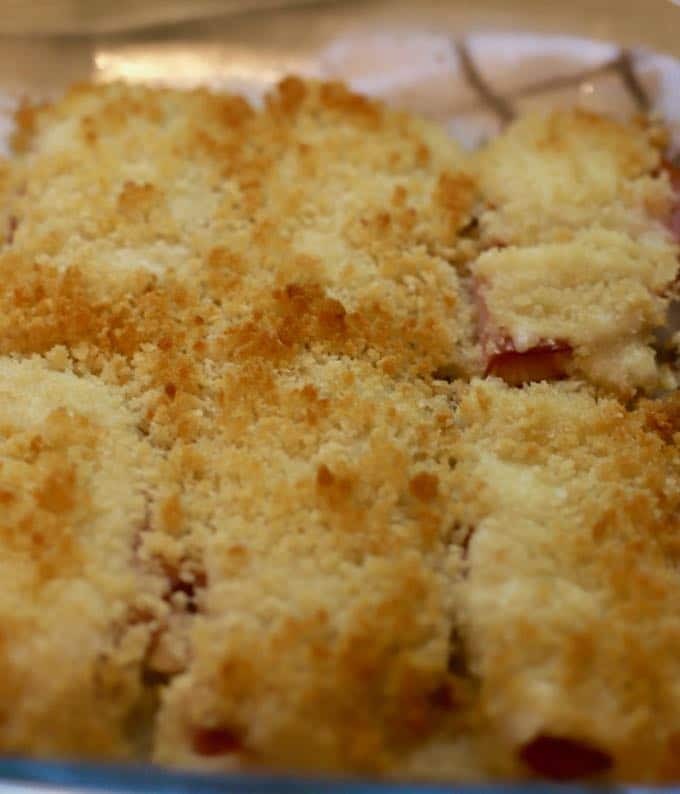 Top the chicken with the panko mixture and bake as directed. While the chicken bakes place the sauce in a saucepan over low heat and gradually heat it. Stir frequently to keep it from scorching. May need to add a little milk to thin it.